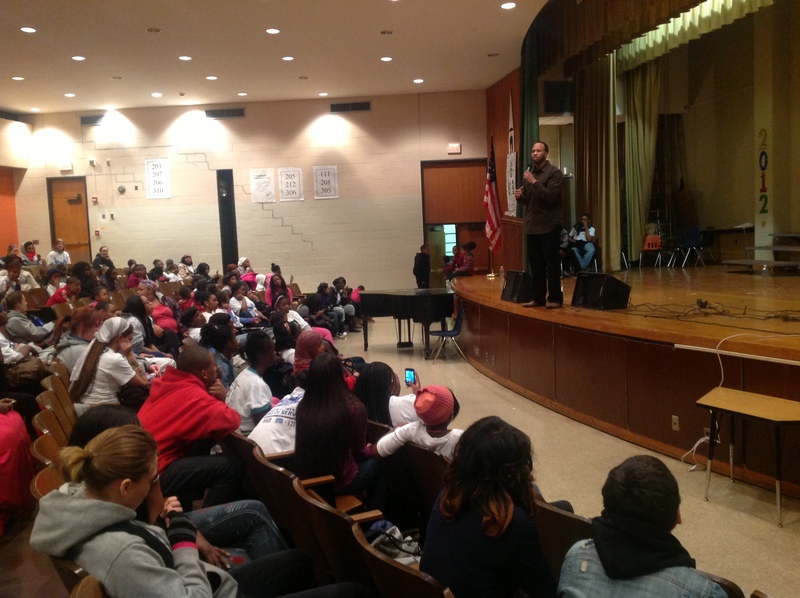 MLK Day 2013: YouthBuild Philly Gives Longstreth Elementary an Extreme School Makeover! Note: Stay tuned for student accounts and reflections on this year’s day of service! For many in the U.S., Martin Luther King Day is thought of as a day off from school or work. At YouthBuild Philly, however, it’s one of our biggest days on. Service in the community is a core element of YouthBuild Philly’s program, and we were excited to partner with the Greater Philadelphia MLK Day of Service again this year by hosting several projects at W.C. Longstreth Elementary in Southwest Philadelphia. More than 200 YouthBuild students, staff and volunteers came together on Monday, Jan 21 to repaint the school’s cafeteria, stairwells, hallways and library. Volunteers painted over the cafeteria’s dull white walls, dreary dark green doors and old, fading Sesame Street characters. These were replaced with a vibrant sky-blue background, inspirational quotes and illustrations, and positive affirmations about the school community. 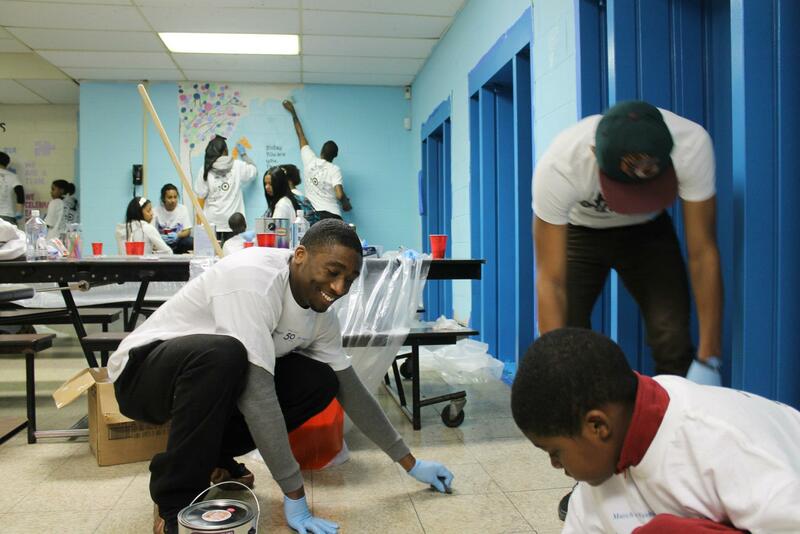 Meanwhile, inside the school classrooms, other teams carried out service projects to serve greater Philadelphia. One team made literacy kits for young learners, while in another classroom volunteers decorated reused t-shirts with messages about sexual abuse for the Clothesline Project. Using clothes and toiletries donated by YouthBuild supporters, another team assembled care packages for shelter residents at Project H.O.M.E. and Bethesda Project. Several volunteers also made no-sew fleece blankets to donate. 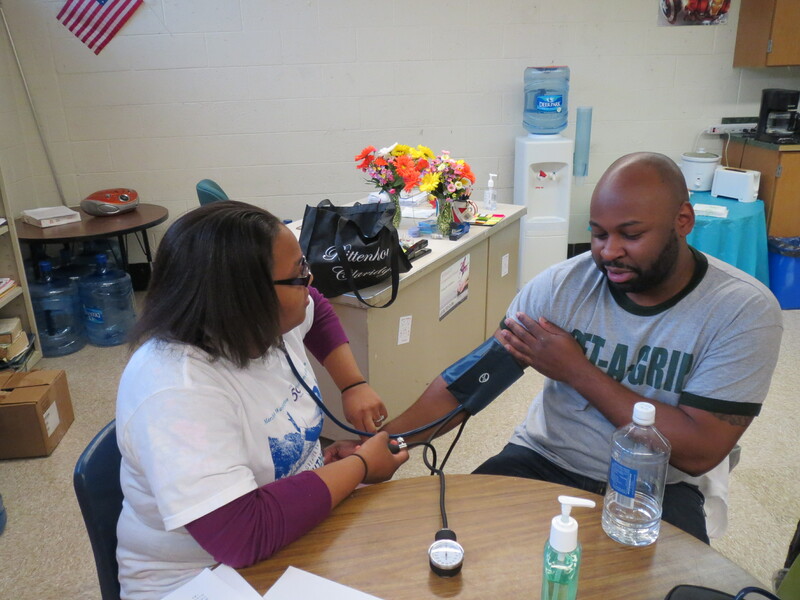 We invited Longstreth students and neighborhood residents to attend the event, which included free health screenings for the public administered by YouthBuild students in the Healthcare training track. Some YouthBuild students and staff braved the below-freezing temperatures to participate in a special project at 20th and Tasker in the Point Breeze neighborhood of South Philly. 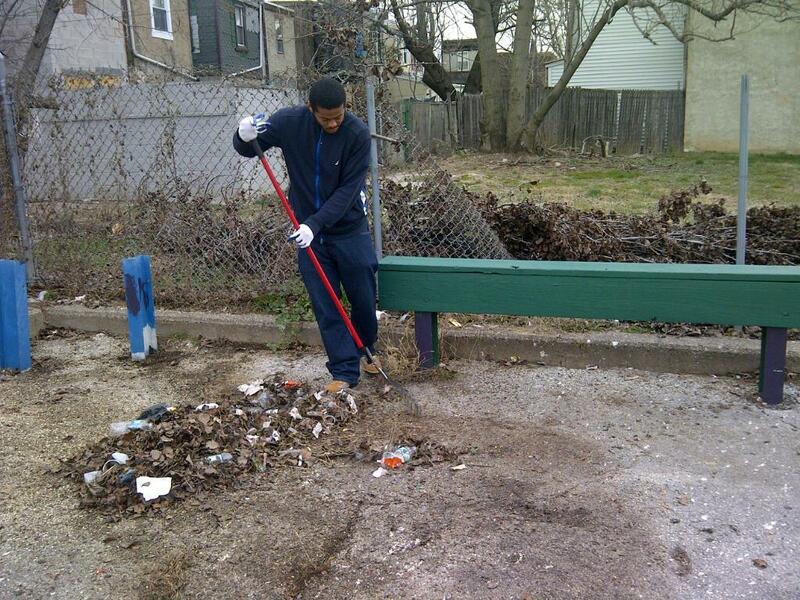 As part of an ongoing partnership with ACE Mentoring and Urban Roots, students collected over thirty bags of trash and helped to repaint a hopscotch court at Ralph Brooks Park, a neighborhood playground and basketball court. This service was a part of an ongoing three-month long collaboration in which YouthBuild students learn from political representatives, community organizers, developers, and city planners about the park revitalization process. Following the morning of service, students and neighborhood residents gathered in the Longstreth gym for a performance showcase featuring spoken word performances by YouthBuild students and local poets such as Lyrispect and Greg “Just Greg” Corbin, as well performances by local artists Fese, DollarBoyz and Yazz The Greatest. We’re so grateful to everyone who partnered with us on this day of service, including our Young Friends, volunteers from DMi Partners, and bottled water company CerebellumH2O. For more pictures from the day, click the gallery below – and follow us on Facebook for even more photos, as well as future updates and pictures from our program and service projects! On Martin Luther King Day, staff, students, and volunteers transformed the interior of an elementary school in Southwest Philadelphia.